An all-day exploit earns Cory Lockwood the overall title, while Amber Neben defends yellow on final stage. Simmons and Clevenger win stage 5. 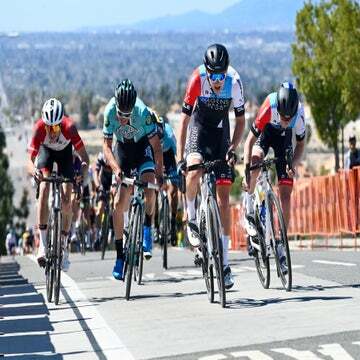 The final day of the Redlands Bicycle Classic was a story of two breakaways. In the men’s race, Cory Lockwood overcame a deficit of more than one minute to win the overall. 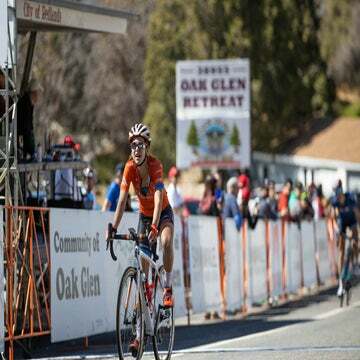 Amber Neben, winner of three previous editions of Redlands, stayed cool in stage 5’s Sunset road race and kept the breakaway in check to claim the women’s overall Sunday in California. Amateur rider Quinn Simmons (Landis Cyclery-Trek) won the final stage after collaborating with Lockwood off the front. Erica Clevenger (Sho-Air Twenty20) won the sprint for stage 5 honors out of a group of three. They were just 57 seconds ahead of Neben — not enough for Lauren Stephens (Tibco-Silicon Valley Bank) to seize the final GC prize. Kevin Vermaeke (Hagens Berman Axeon) came into the day with a 1:08 lead on Lockwood. He could not control the break on the hilly circuit, in part due to the fact that he only had one teammate to work with after Sean Quinn and Thomas Revard crashed out early. Neben (Trek Red Truck) on the other hand, was able to hold it together despite uncertainty about her form. Unlike Neben, Clevenger is a relative newcomer to Redlands, and she was thrilled to win a stage. 4. Sam Boardman (Wildlife Generation), s.t. 5. Ben Schmutte (First Internet Bank Cycling), s.t. 7. Chris Riekert (Team Mike’s Bike pb Equator), s.t. 8. Tyler Williams (California), s.t. 9. Luis Villalobos (Aevolo), s.t. 10. Bernat Font Mas (303 Project), s.t. 2. Sara Poidevin (Rally UHC Cycling), s.t. 5. Leighann Ganzar (Hagens Berman-Supermint), s.t. 6. Jasmine Duehring (Sho-Air Twenty20), s.t. 7. Simone Boilard (Sho-Air Twenty20), s.t. 9. Krista Doebel-Hickok (Rally UHC Cycling), s.t. The day prior, Rachel Langdon (Amy D Foundation) won the stage 4 women’s criterium out of a breakaway of six riders, and Noah Granigan (Floyd’s Pro Cycling) won the men’s stage from a group of nine.